To examine the effect of heating up a Basler acA640-100gm on image dark current noise during imaging, I conducted an experiment where I took multiple longer (~2 min) films (conditions: dark room, cap on, constant ambient temperature) with different frame exposure lengths and observed mean image pixel value at the beginning and end of the test. Frame exposure lengths and film durations are approximately equal to the ones used in planetary imaging with this camera and not suitable for DSO imaging. 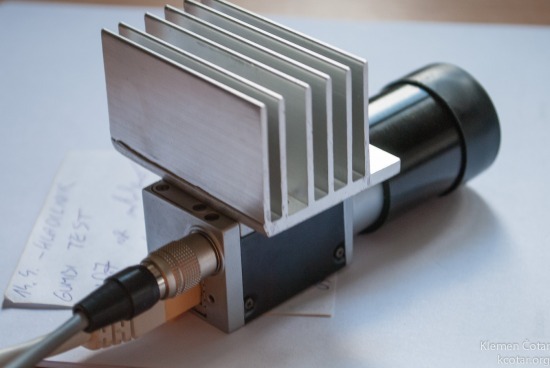 Basler camera with attached DIY aluminium cooler (without any fan), salvaged from an older CPU. 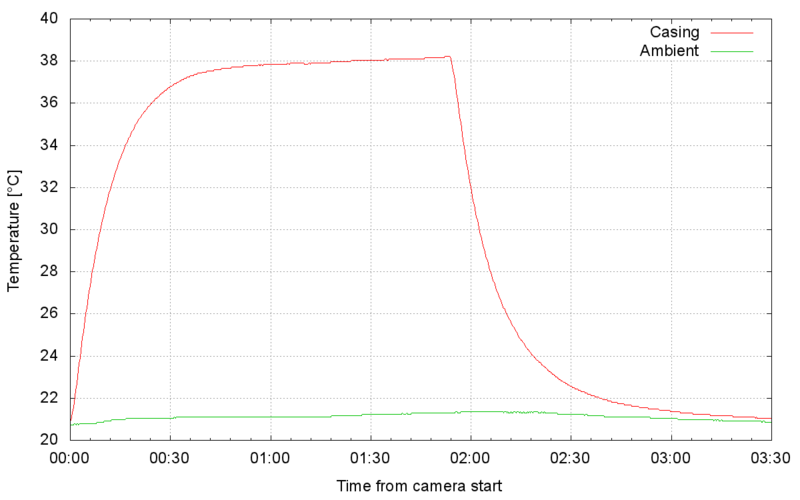 The following graphs show, the change of camera casing temperature over time in comparison to the constant ambient temperature. From the plots it is observable that majority of heat up occurs in the first 30 sec of imaging and remains almost constant after that. Working temperature plot with attached cooler. Working temperature plot without attached cooler. 6 – The Eta Aquariids meteors peak with a ZHR of 40. 7 – Mercury reaches greatest evening elongation at 21.2 degrees east of the Sun at 4:00 UT. 20 – The Jupiter moons Io and Ganymede cast a double shadow on planet Jupiter from 22:04 to 22:33 UT. 21 – The Jupiter moons Callisto and Europa cast a double shadow on planet Jupiter from 11:26 to 11:59 UT. 22 – Saturn reaches opposition at ~1:00 UT. 28 – Asteroid (532) Herculina at opposition shining at magnitude +9. 28 – The Jupiter moons Io and Ganymede cast a double shadow on planet Jupiter from 00:01 to 2:18 UT.